Key difference: A cake is a form of bread; whereas brownie is something in between a cake and cookie. A cake can be bread or a pastry. A cake is a form of bread, which can be decorated with icings and creams. Nowadays, cakes are of layered form. The icings are made up of creams, which are applied in between the layers. Cakes are usually favorites of all. They are available in various flavors depending on the ingredients available. Cake is often the dessert for meals at ceremonial occasions, particularly weddings, anniversaries, and birthdays. There are countless cake recipes; some are bread-like, some rich and elaborate, and many are centuries old. 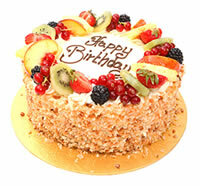 Cakes add tributes in the occasions, it is considered to be of prime importance and attention in ones party. Cakes are decorated with fancy innovative designs by the bakers. There are many renowned shops available in the market today, which are famous as cake shops. A brownie is a small square piece of rich cake, usually made with chocolate. They are a cross-product of cake and cookie. They are made with stuffing and then baked together. Brownies are available in a variety of forms. They are either fudge or cake, depending on their density, and may include nuts, frosting, whipped cream, chocolate chips, or other ingredients. 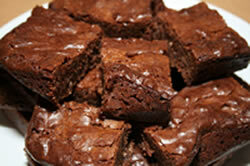 Brownies are common lunchbox fare, typically eaten by hand, and often accompanied by milk or coffee. They are sometimes served warm with ice cream, topped with whipped cream or sprinkled with powdered sugar. They are especially popular in restaurants, where they can be found in variation on many dessert menus. They are chewy in nature. Brownies are cross of cake and cookie. Cakes are sweet in taste. They have a typical sweet taste of chocolate. They are soft, spongy and not chewy. They are not soft and spongy, but are chewy. Here the flour is the main ingredient. Here the use of flour is less. They have a creamy surface with icing on the top. They have dense and crackled top surface. They have less content of chocolate compared to brownies. They have more content, usually of chocolate only.